“What’s your name, boy?” the Union soldier barked, his bayonet just inches from Johnny McLean’s nose. Johnny gulped, finding it hard to breathe. It was nearly dark, and he couldn’t imagine how he’d been spotted. He’d made his way carefully through the woods, planning to sneak close to the Union camp to get a glimpse of General Grant. But the Union lookouts had spied him as he scurried across the road. Now he was in real trouble. “I said, what’s your name?” the soldier prodded him again, the bayonet inching closer. “J … Joh … Johnny. Johnny McLean,” he stammered. “Well, what do you know? Looks like we caught us an actual Johnny Reb,” the soldier smirked. 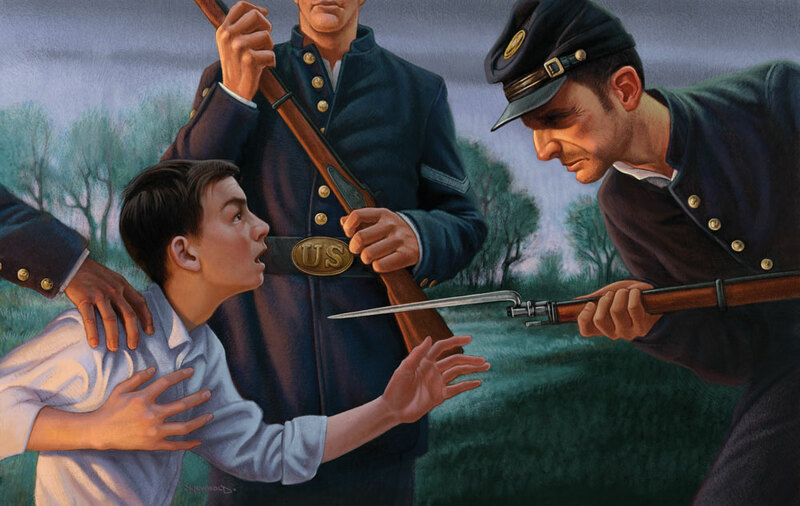 Johnny waited for the Yank to lower the bayonet, but the sharp metal blade never wavered. Johnny cursed his luck. He thought keeping to the trail through the woods would get him close to seeing General Grant. He’d heard General Ulysses S. Grant was a monster. That he wouldn’t stop until he’d destroyed the Confederate Army to the last man. Some said Grant even had horns growing out of the side of his head like the devil. Johnny didn’t know about that. All he knew is he wanted to see this man with his own eyes. He’d snuck away after supper. Johnny didn’t mention his plans to his parents, who would have forbidden it. He was only 11 years old. All around them the two armies were fighting each other, and it was dangerous. As the Union Army had tightened a circle around their town, his parents had grown more anxious. It was understandable. When the war started they had lived in Manassas, up in northern Virginia, and the very first fight of the war, the Battle of Bull Run, took place practically outside their front door. General P.G.T. Beauregard, who commanded the Confederate forces then, used their home as his headquarters. At one point, an artillery shell fell down their chimney and landed in their fireplace. Luckily, it was a dud. Johnny was only 7 then, but he remembered it well. The battle was horrible. Though the Confederate Army won a great victory, Johnny’s father had seen enough. He packed them up and moved them away from Manassas to the town of Appomattox Court House in the center of Virginia. He thought his family would be safer there. For a while, they were, but now the war had found them again, thanks to the monster General Grant, who had the Confederates on the run. General Lee and his men had once seemed invincible. Now General Grant and the Union Army just kept winning. Two other soldiers stood behind the man holding the bayonet on Johnny. He looked at them, his eyes pleading. But they apparently had no opinion on his fate. “At ease, sergeant,” a commanding voice cut through the night. Having been focused on the bayonet, Johnny had failed to notice a small group of men riding up the road on horseback. Their faces were illuminated in the rising moonlight, and Johnny could see from the insignia on their shoulders that they were officers. The soldier immediately dropped the bayonet and came to attention, as did his two companions. “General Chamberlain, sir!” the sergeant said, saluting. “What are you doing here, sergeant?” the general asked. “I believe I’ve caught a rebel spy, sir!” the sergeant barked in reply. The general considered Johnny from his horse. “What’s your name, son?” General Chamberlain asked Johnny. “Johnny McLean, sir.” Now Johnny was even more nervous. He wondered if this General Chamberlain was the General Chamberlain, the Union hero of the Battle of Gettysburg. Johnny had read about him in the papers. He had been a college professor in Maine before the war. As the war dragged on, he’d been promoted all the way to major general. “Are you a spy, Mr. Johnny McLean?” the general asked. Johnny didn’t say anything, but the look on his face caused General Chamberlain to laugh. The pickets reacted with whoops and hollers. Johnny remained quiet, unsure of what he was supposed to do. “How do you feel about that, Johnny McLean?” the general asked him. “How … sir? I … guess … I … I’m glad it’s over, sir,” Johnny stammered. “Really? You’re a Virginian. … Why are you glad?” the general seemed genuinely curious. The general shifted on his horse. A young officer in his party spurred his mount forward. General Chamberlain spurred his horse and rode off into the night. As things worked out, the next day Johnny McLean did get to see General Grant close up. 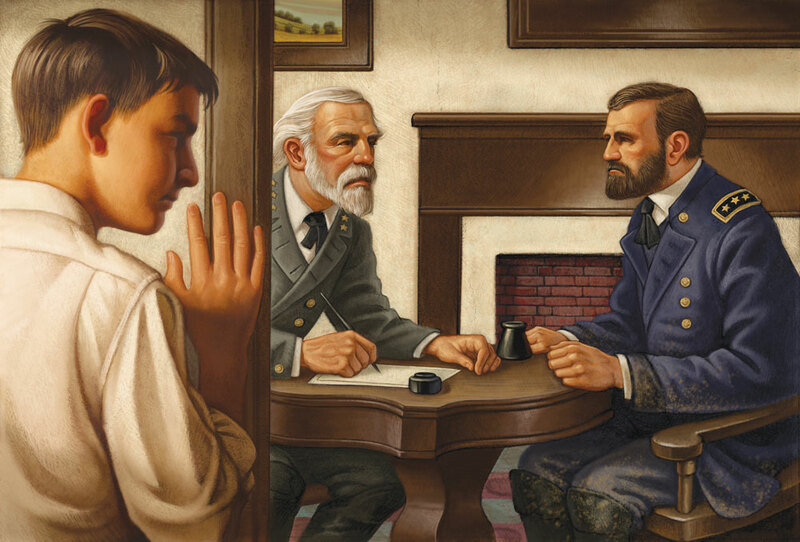 His pa informed him that General Lee would be coming to sign the surrender in their parlor. Right in Johnny’s house! General Lee arrived long before General Grant and waited patiently for his enemy. He was dressed in an immaculate dress uniform and was courteous and kind to Johnny’s family. He politely replied with a “No, thank you, ma’am,” when Johnny’s mother asked him if he’d like anything to drink. When General Grant finally showed up, he was wearing an old muddy uniform. He doesn’t look like a monster, Johnny thought, just a tired man. He strained to listen from the kitchen, but the two men spoke too quietly to hear much. Johnny thought back to the day four years ago when the war started right outside their home in Manassas. Johnny’s father was always talking about one of President Lincoln’s famous speeches in which he’d said, “A house divided against itself cannot stand.” Lincoln believed the nation couldn’t survive with one side fighting against the other. Now Johnny looked at his own parlor, with General Lee on one side and General Grant on the other. The house was still divided, but it was coming back together. After a lengthy discussion, General Grant wrote out the terms of surrender. General Lee agreed and signed the document. The war was effectively over. Three days later, the Confederate Army marched into Appomattox Court House to formally surrender. From the front of his house, Johnny spotted General Chamberlain watching as the defeated army marched by. With a wink at Johnny, he called out an order. His battalion of Union soldiers came to attention and saluted the tired, ragged Confederate soldiers as they stacked their muskets. As the worn-out men staggered by, Johnny imagined that each step they took was a step toward a new day. Johnny returned General Chamberlain’s salute. The general smiled. They’re small steps, Johnny thought. But they are steps. New York Times best-selling author and Eagle Scout Michael P. Spradlin has written many books for young readers, including the international best-selling The Youngest Templar series. 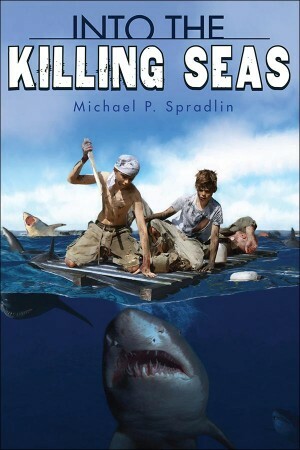 Click here to win a copy of his upcoming book Into the Killing Seas, based on the true events of the 1945 sinking of the USS Indianapolis, tells a harrowing story of World War II. This entry was posted in News & Reviews and tagged homepage, spotlight on February 17, 2015 by Clay Swartz. Great story right to the point!